Below we have listed our features available with thorough descriptions, including measurements. If you have questions regarding any of these items please feel free to contact us. The large pavilion measures 72 x 45 ft. and seats 250 people comfortably. There are 10 ft. and 12 ft. openings to the area surrounding the pavilion and 18 ft. to the ceiling at highest point. The pavilion has a concrete foundation with gorgeous auburn roof. The pavilion is completely customizable for decorating including hanging items under 15 lb. You can create a custom seating plan or use a pre-approved Lost Hill Lake plan. The small pavilion measures 20 x 30 ft. and is recommended for serving. There are large openings on either end of the pavilion and 10 ft. to the ceiling at the highest point. Buffet dinners, desserts and drink lines can serve 10-20 people in this space at a time with beautiful string lights for use all night long. We have two sizes of tables for receptions and dining. We have 12, 8-top tables that measure 6.5 ft. in X 2.5 ft. and 14, 10-top tables that measure 8 ft. X 2.5 ft. both made from Lost Hill Lake cedar and walnut trees. Each table has white legs and can be moved easily to fit a custom or provided seating plan. For head table seating we recommend the use of two tables. For 12 - 16 guests at your head table we recommend using four rectangle tables. Please see the LHLE provided seating plans for more examples. We have two sizes of cocktail tables for surrounding areas or seating. We have 3.36 in. wood top round tables, measuring 30 in. tall with a white base. We also have 6.36 in. wood top tables shorter in height. We recommend using these tables around the dance floor for lounging, drinks and mingling during the cocktail hour and reception. For your ceremony backdrop we have two arbor options. 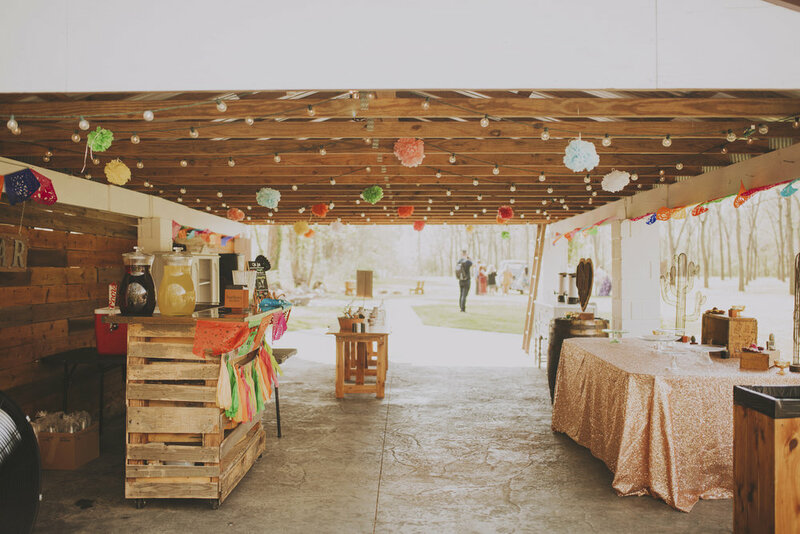 If you would like to use one of the Lost Hill Lake arbor options or decorate the arbor with decor yourself, please discuss with your coordinator before your event. Our Walnut Arbor is 6 ft. deep X 8 ft. wide X 8.8 ft. tall and is made from Lost Hill Lake Walnut trees. Our Teepee Arbor is 12ft tall at its highest but can be lowered with a wider base. The Walnut Arbor as well as the Teepee Arbor are able to have items hung on them or attached to them. We have a variety of beautiful larger and smaller tables that can be customized, moved and used for any purpose during your special day. Included in this selection are a variety of small, wooden tables, matching our guest tables. These are recommended for use for the ceremony if needed. 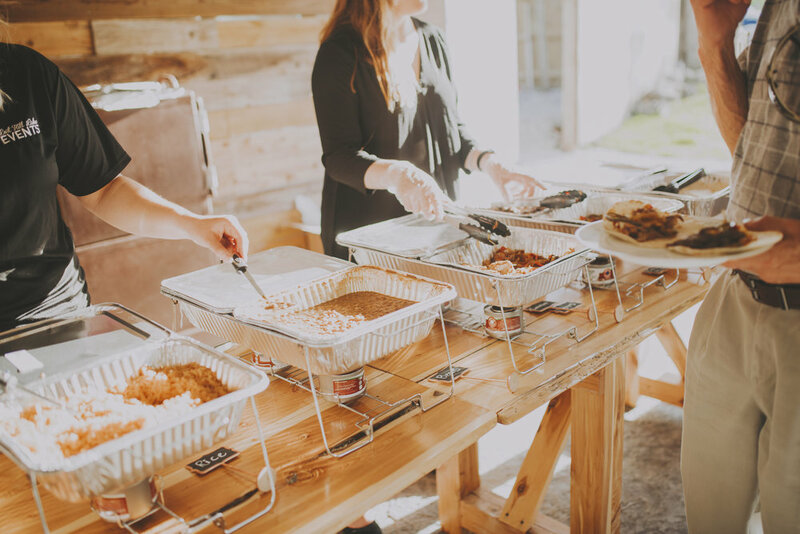 We also have a buffet table, providing a great length for all of your food to be in one place. Two oversized display tables that measure 7.3 ft. X 4.1 ft. are recommended for desserts and four picnic tables for use anywhere on the property. Our provided ceremony and reception seating are wooden chairs. We are able to provide this mixed seating for up to 250 guests. You can create a custom seating plan or use a pre-approved Lost Hill Lake plan. Our hand crafted doorway not only creates privacy for the bride before walking down the aisle but a beautiful, anchored focal point in the walnut grove to draw guests to the ceremony site. The wooden panels on each side of the doorway are 6ft. 7in. wide and at the highest point, the door way is 7ft tall. The antique white doors combined are 4 ft. 10 in. wide. The doorway and doors are able to have decor or florals hung on them or attached to them but please discuss with your coordinator prior to your event. The doorway is often flanked by our half whiskey barrels accompanied by decor or additional flowers. The doorway can also be used a ceremony backdrop/arbor if you are having a celebration of 75 guests or less. Our outdoor venue requires restroom rentals. Included in our Wedding Packages is one, strategically placed, luxury restroom trailer with heating and cooling, out of the way for any photos but still accessible for any guest. Included in our restroom cove is a beautiful hand crafted table for displaying bug spray and any other decor you would like to add. For more information click here. We provide numerous yard games for use during cocktail hour or reception. Games include bag toss, a set of washers, a giant connect four and an oversized version of Jenga. You are able to place games wherever you would like on our property and select which games for your guests to enjoy. You are also welcome to bring any of your own games that are special to your family. We provide three bonfires with ample wood and staff to tend the fires throughout the night. Included in some of our Wedding Packages, are s'more stations for snaking during cocktail hour or reception. The s’more station is made up of graham crackers, marshmallows and Hersey's chocolate as well as roasting sticks. We provide a coffee station with complimentary regular and decaf coffee options. We also provide sugar, cream, insulated cups and other coffee needs to create a warm drink with dessert. The cedar gazebo is a 10 ft. hexagon customizable for you event. The gazebo can be moved around the river portion of Lost Hill Lake Events property and you can decorate it however you would like. We have seen it used for ceremonies, a comfortable place for musicians to sit and photo booths.